Forest and bush tracks can be sand, clay, mud, dirt, gravel and even rocky, the reason for this separate section just for forest tracks is to cover fallen trees, branches and overgrown tracks. Other terrain types should be used in junction with forest tracks for full coverage of tips. 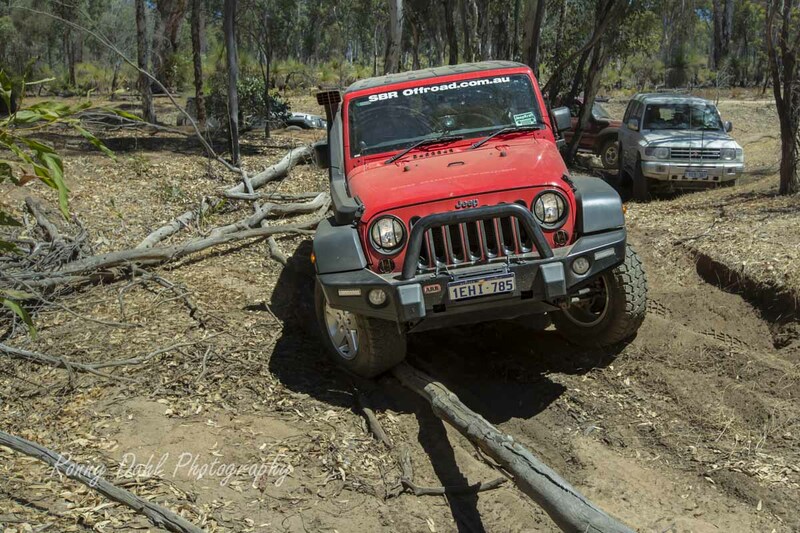 Jeep Wrangler Dodging Timber On Bush Tracks. Branches are not too much of a problem, they can easily be removed just by picking them up and moving them off to the side. It's actually rare not so see fallen branches even on well used tracks. 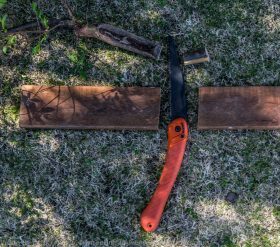 Carrying a garden saw (a cheap $20 foldable saw) will work wonders. Make sure it has big pointy teeth as fine saws just don't do the job unless you have half a day. A garden saw with big pointy teeth can saw through a 50-75 mm thick branch in under 4 mins (have done this countless times with my cheap saw). Sometimes the branch will be dead and dry or rotten, in this case it can be easier just to snap it by hand. For thicker branches a small chainsaw is very handy, these days they make cheap cordless chainsaws that hardly make any noise. Fallen trees are a bigger problem. However if the tree is too big to cut it doesn't mean it can't be passed. 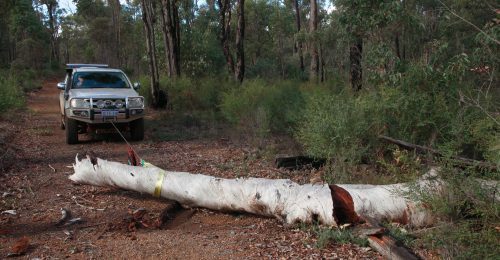 If the tree is only 100-250mm thick most 4wd with a 2inch lift kit should be able to carefully drive over it, if the tree isa little bit thicker use a spotter. If the tree is 350mm or even bigger, it could be passed by building tracks on both sides, find some smaller logs and rocks and build up both sides in order to make it passable. Once the first 4x4 is over expect to repair the track build each time. For the larger to huge fallen trees there are sometimes tracks around them which might be very tight, if not and you’re lucky enough to be carrying a large chain saw you could proceed to cut. Once the tree is cut use a winch or drag chain to remove the fallen tree from the track. Some larger trees across the track are rotten, if so there is a good chance a winch could snap it in half. Only try this if the tree is well rotten and stop winching if nothing happens within 5 seconds of winching as this will indicate it’s too big or not rotten/soft enough, make sure to use a tree trunk protector to save the rope/cable from damage. Overgrown vegetation on bush tracks. Overgrown tracks generally mean one thing, no one else has been down this track for some time. This is where the 4wd will really get pinstriped (scratched and scraped). Once you have pinstriped your vehicle more than 10 times you will find that you stop worrying about it too much and just enjoy the fact that no one else has been where you are right now for some time. Scratching your vehicle is a major reason why a lot of people just don't take their 4wd's off road. To go off road you need to get over the fact that you will pinstripe the 4x4 at some stage, it's all worth it. A real 4 wheel drive is pinstriped. A sparkling clean scar free 4 wheel drive is just a SUV or soccer mum’s vehicle. When driving through overgrown tracks you can minimize scratching and damage by sticking to the side that has the freshest vegetation (if there is a choice at all). Fold the mirrors in as they might go missing on those real dense tracks. Get out and chop off the thicker vegetation, sometimes there will be branches too, these would be wise to cut off as you’re not out there to get pinstriped you’re out there to get to where you want with the least pin striping possible. When going down a dense track, keep in mind that if you do in fact have to return the same way all the overgrowth will be facing towards you on the way back. Every branch and bush will be one and a half times worse than before. If following others on bush tracks you have the advantage as most of the pin striping bushes will be slightly pushed forward and away from the track, allowing more space for you. If you have taken the wrong turn down a really bad overgrown track it can be near impossible to turn around and even worse reversing as it's near impossible to see anything at all. Also the mirrors will be in danger of snapping off while reversing. In this case it would be best to just keep heading forward until you find a more suitable place to turn around or you find another bush track heading towards the first intended direction (only do this if you know exactly where you are i.e. : off road GPS with memory map). See other terrains for actual terrain PSI. For mounting large trees and logs a PSI of 16-22 should do the trick. Leave Bush Tracks And Go To Home Page.